Once in a lifetime experience – Meeting the Man Himself! It was just like any other day. I woke up in the morning and opened the Metro Plus supplement of The Hindu. There was a small news item saying that there was going to be a special programme at Landmark, Nungambakkam where the DVDs of Mani Ratnam’s movies are going to be launched by the man himself and anybody could attend it! I couldn’t believe my eyes! 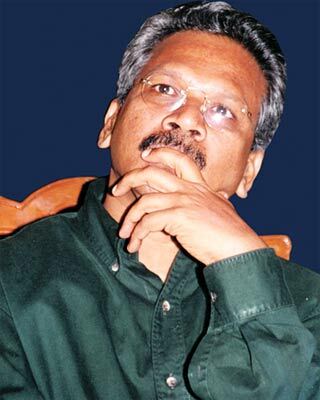 Mani Ratnam rarely makes a public appearance! I very badly wanted to be there for the DVD launch at any cost. The D-Day finally arrived! The programme was to start at 6.30 and I was there at 6 itself. The whole of Landmark was buzzing with activity. Chairs were arranged in an orderly manner for everybody to sit and DVDs to be launched were already available for sale. I immediately went and bought the DVDs of two movies. The first celebrity to arrive was the ace cinematographer P.C.Sreeram. Then came actor Parthiban and his daughter Keerthana, Mani’s asst. directors (now noted directors in their own right), Susi Ganesan and Azhagam Perumal. Director Gautham Menon had also come. Then came actor Suriya! He came and sat quietly in a chair. I immediately ran and got his autograph! I was just coming back to my chair when the man himself arrived!!!! Just seeing him itself fulfilled one of my life’s biggest dreams! The last celebrity to come was Madhavan! The evening began with a presentation showing clippings of various movies of Mani Ratnam. Then he was interviewed by the host of the evening, Jayakumar. In between, he also answered some of the questions asked by the audience and then there were also questions to the audience about his films for which Mani’s films’ DVDs were given away as prizes. I too answered a question correctly and won a DVD! The question asked to me was ‘Where was the suicide bomb scene in ‘Kannathil Muththamittal’ shot?’ I gave the correct answer (Pondicherry) and Mani Ratnam remarked, ‘She has given it all away now.’ It was and will always be one of my most happiest moments in life. Madhavan, Suriya, P.C.Sreeram and Keerthana shared their experience of working with Mani Ratnam. In the end, Maniratnam autographed the DVDs that were sold on that day. I ran and got my DVD (DVD of Alaipayuthey 😀 ) autographed and I was the first one to get his autograph! P.S. : Of course so much was written about this DVD launch last year itself. But thinking about it and writing it today made me once again feel the happiness/excitement that I felt on seeing Mani Ratnam and I still can’t believe it all really happened! This entry was posted in Mani Ratnam on December 6, 2006 by admin. Aparna, u didnt ask any Qstin to him ?